Some people are just born into a business or profession. Others take early life experiences and shape a lifelong path that becomes a rewarding and meaningful vocation. Wendell White, Chairman of Generations, LLC seems to fit both models. Generations is one of the leading innovators in designing and managing senior living and care facilities on the West Coast. It’s an award-winning business that has, at its core, a near perfect blend of Wendell’s experience and vision. When Wendell was a young boy, he lived in an apartment attached to a nursing home owned and operated by his grandparents in Grants Pass, Oregon. His grandparents raised him there, and that put Wendell in direct and early contact with the challenges of providing compassionate care and living settings for our community’s eldest members. By the success of Generations, it’s clear that Wendell learned and took to heart those early experiences. As an organization, Generations, LLC runs two senior care facilities in Oregon (Town Center Village and Cherrywood Village); one in Walla Walla, Washington (Wheatland Village); one in National City, California (Paradise Village); and, one in Layton, Utah (Fairfield Village). 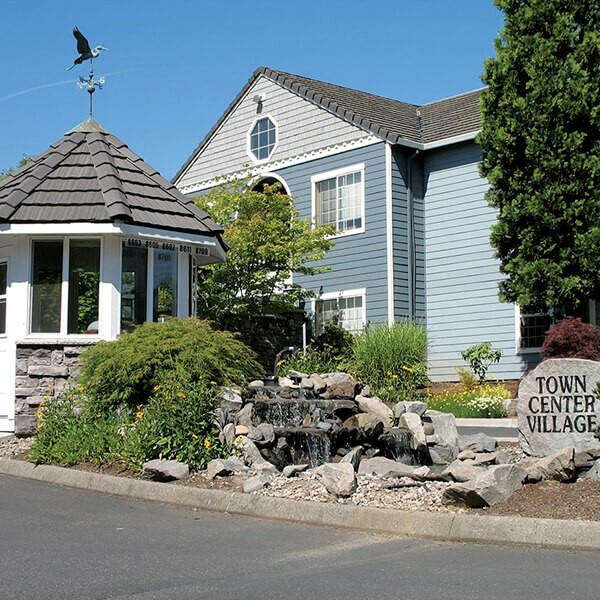 Town Center Village is located in what was once very rural Clackamas County in Happy Valley. Growth and development have caught up with the neighborhood as that region of the greater Portland-Metropolitan area has seen tremendous growth in recent years. Town Center Village offers a full range of options for seniors: retirement living for more independent seniors; assisted living options for seniors with more pressing health, mobility and assistance needs; and supporting all residents at Town Center Village is a full service skilled care and rehabilitation center. Wendell was an early proponent of higher-end design models for senior facilities, and that is reflected in the elegant and homey touches you will find at Town Center Village. The facility is modeled after a classic European Village where residents can have private housing while still living in an environment that encourages walking, strolling, meeting and routinely interacting with your neighbors and fellow “townspeople.” There are a number of housing options to fit nearly every lifestyle, mobility, health and financial situation. While the variety of settings, options and service levels is a big plus for residents (current and prospective) and for the staff at Town Center Village, the complexity does present its own challenges when it comes to insuring and servicing all who work there. Meeting and supporting the unique needs of its staff is one reason why Town Center Village has turned to the strength of the SAIF OBI CompSAFE workers’ compensation insurance program. The combination of consistently competitive rates through the program and the full range of support services provided by SAIF make it a winning combination for Town Center Village. The shared experience of success is a key ingredient in Wendell’s continuing vision for providing the best possible senior care. It’s a vision and a mission that’s been passed on to his family. Along with Wendell, the principals overseeing Generations, LLC include his wife Betsy, and their children: daughter Melody and her husband Chip Gabriel; and son Robert and his wife Jennifer White. Their winning vision has been recognized by a number of organizations. In 2012, the Austin Family Business Program at Oregon State University named Generations its Outstanding Large Family Business. The Oregon Health Care Association has bestowed several honors on Generations, including its Leadership Award, its Special Service Award and a Lifetime Achievement Award for Wendell, personally. These awards are just part of a well-earned validation of the vision that began with a small boy’s experiences from an apartment in Southern Oregon. It’s a vision that continues to touch and improve the lives of hundreds of individuals today.